Nava Atlas has published a bunch of cookbooks. The ones I currently have and cook from include "Soups and Stews for All Seasons", "Vegan Express", and "Wild About Greens". This is an adaptation of a recipe from Nava Atlas in her fabulous cookbook called Vegan Express. Roast about 8 cloves of garlic (place 8 cloves, drizzled with a touch of olive oil in a little piece of aluminum foil ... don't wrap them up or anything ... the foil just acts as a holder for the garlic and oil). Roast at 425°F for 15 minutes or so ... until slightly browned, but not burned. It works well to do this when you're using the oven for something else. In a food processor, puree up one box of firm or extra firm silken tofu (12.3 ounces). Add in the 8 cloves of roasted garlic and 1 teaspoon salt. Puree till smooth. Spread this garlic-y spread on a pizza crust. 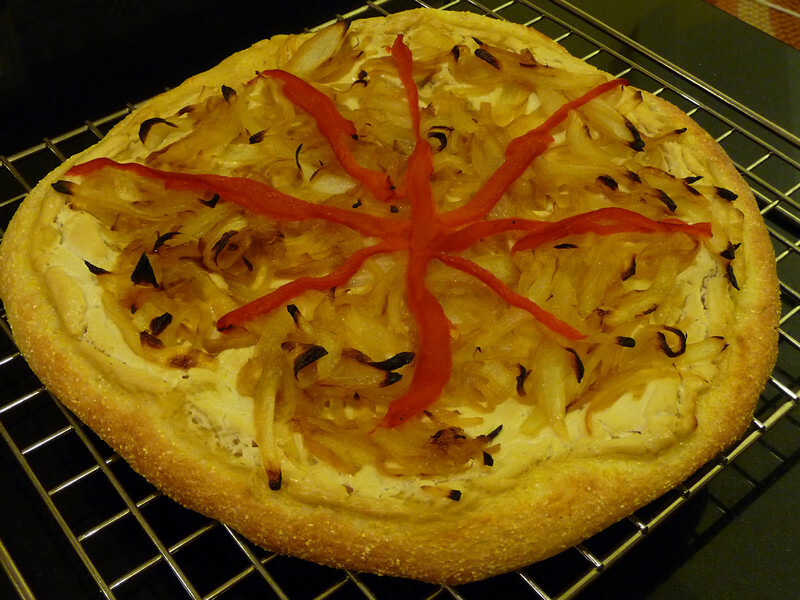 Top with caramelized onions. Add some roasted red pepper strips for color. Bake at 425° till crust is done and all toppings are hot. For gluten free folks, this pizza crust mix, while a bit pricey, is SUPER tasty!